Continuing the recent insect theme: This leafy-looking fella was hanging out on garbage can this weekend. And now some crowd entomology: Can anyone tell us what sort of insect this is? A common true katydid, to be specific. Wait, can I send in another?! Actually, I might be wrong but to me it looks more like a Greater Angle-wing Katydid. I think Naomi is correct and I was wrong about the species. 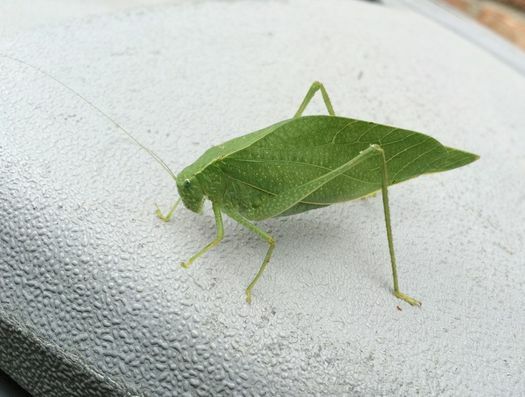 The one we hear doing the "ka-ty-did" sound at night is a common true katydid, and I thought that was the only kind we had around here. But this does look right for angle-winged.